The Bust at OWS: "Don't Mourn For Me, Organize"
Mike Bloomberg is nothing if not consistent. He's America's leading apologist for the 1%. His recent defense of banks and Wall Street as blameless for the financial meltdown the Great Recession was New York chutzpah in extremis. It was obvious he sensed the long-term dangers that OWS poses to his vision of American. Clearly, the use of cops to sweep Zuccotti Park was always where he was headed. History works itself out in unexpected ways. The initial beauty and effectiveness of OWS was its non-hierarchical, amoeba-like incarnation. It replicated across the world based on two insights: Technology, properly used, can swiftly create organizations of gigantic proportions, and most people understand that wealth and power are now more concentrated that ever before and that's a bad thing for all of us. It didn't need leaders and spokespeople. Bloomberg's sweep of Zuccotti Park changed all that and forces OWS to examine its future. The challenge to OWS is real. Can it turn its' technological genius and simple message into an organization that makes real, practical change in people's lives? We've worked out a democratic system that permits aggregations of human beings to challenge aggregations of money. The civil rights movement, the women's movement, labor, anti-war, environmental, etc. et. al., all found ways to make politics, government and daily life better for the great majority. Now it's OWS' turn. Can it transform, develop an agenda, participate in conventional politics and change the power arrangements in America and elsewhere. Can it do all that without losing its' integrity, transparency and openness? Yes, it can, but it won't be easy. One of the lasting progressive images from the beginning of the labor movement is the moments before the execution of a labor organizer named Joe Hill, on trumped-up charges. His last words, "don't mourn for me, organize" became part of a song written by Alfred Hayes and Earl Robinson that Pete Seeger and many others made famous. 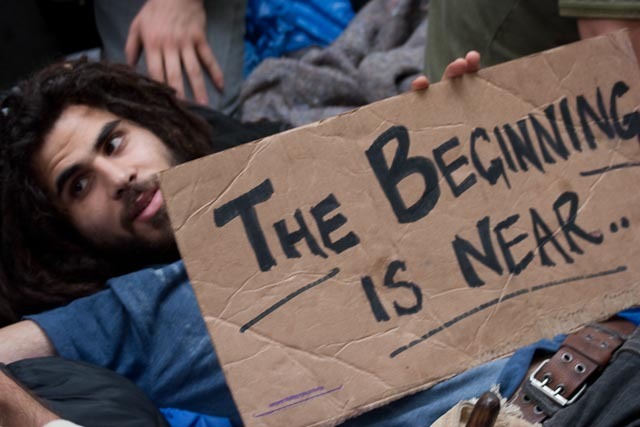 Now the OWS movement has arrived at its defining moment, thanks to a phalanx of cops and a mayor by, of, and for the 1%.